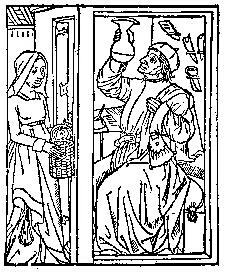 I was looking around for some medieval woodcut clip art (I know, my interests are a little eclectic) and I felt drawn to this one which depicts medieval woman taking a urine specimen to her doctor. 🙂 Perhaps this is a depiction of the earliest pregnancy test? The doc looks a little scary in his little booth in his fancy robes and scary tools hanging on the wall, scrutinising her flask of wee. She waits with her little basket to get her wee wee returned. I think 21st Century pregnant woman has it ok so I now know not to complain about my recent visit to a disinterested doctor – it could be worse! Woman visiting a doctor, who examines her urine flask; from the Mer des Hystoires, Paris 1488-89.